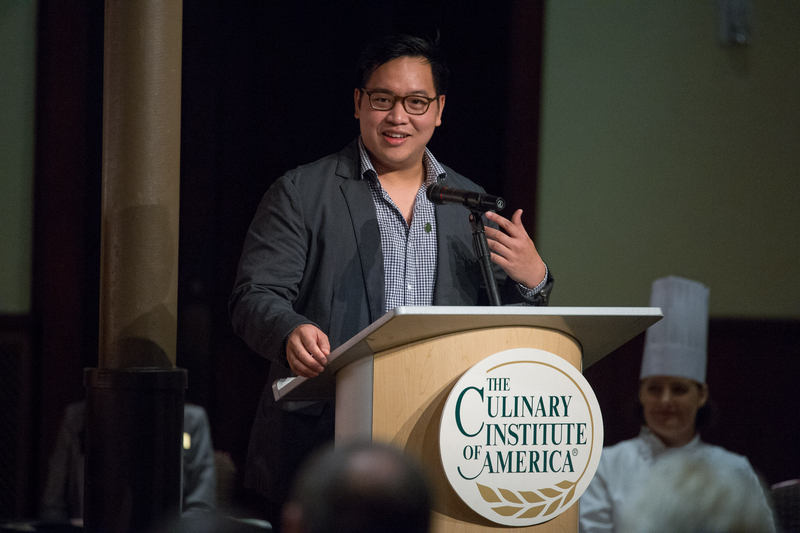 San Antonio, TX – Justin Yu, executive chef and co-owner of Oxheart and Public Services Wine & Whisky in Houston, was the keynote speaker during commencement ceremonies at The Culinary Institute of America, San Antonio on April 15. Chef Yu is a 2005 graduate of the CIA’s New York campus. At age 31, Chef Yu has already received numerous honors during his young career. In 2013, Food & Wine magazine named him one of the Best New Chefs in America. That same year, he was a semifinalist for the James Beard Foundation Award for Rising Star Chef of the Year, and 2016 marks the third consecutive year he has been a finalist for the Beard Award for Best Chef: Southwest. Since Oxheart opened in 2012, Yu’s restaurant has earned its own accolades, including the Houston Chronicle twice naming it the number one restaurant in Houston and number two the other year. Oxheart was also a 2013 semifinalist for the Beard Award for Best New Restaurant, Bon Appétit called it one of America’s 10 Best New Restaurants, Condé Nast Traveler cited it as one of the Best New Restaurants in the World, and GQ magazine named it one of the hottest openings of the year. Chef Yu’s second restaurant, Public Services Wine & Whisky, opened in September 2014. The CIA San Antonio offers associate degrees in Culinary Arts and Baking & Pastry Arts. Graduates can then transfer to the college’s New York campus to complete bachelor’s degrees in Management, Culinary Science, or Applied Food Studies.